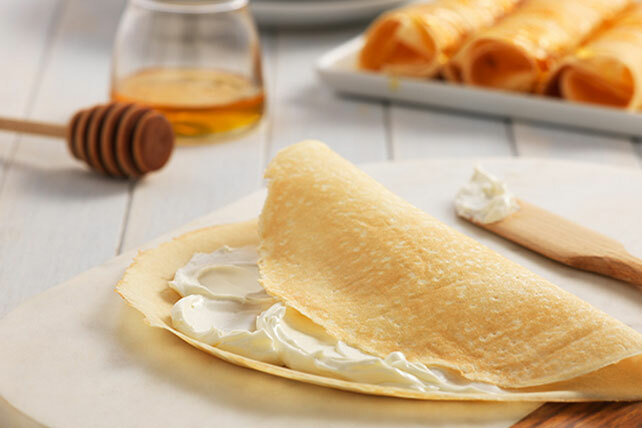 An elegant recipe is just minutes away with these delicious crêpes. A cream cheese filling wrapped in tender crêpes makes for a perfect breakfast or brunch recipe. Place crêpes on microwaveable plate. Microwave on HIGH 15 sec. or just until warmed. Spread 2 Tbsp. cream cheese product onto centre of each crêpe; fold in opposite sides of crêpe, then roll up burrito style. Prepare using Philadelphia Cinnamon Brown Sugar Cream Cheese Product.